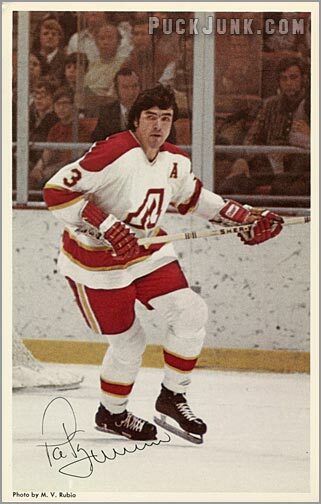 The World Hockey Association was founded in 1972, and placed several teams into markets that yearned to have an NHL presence. 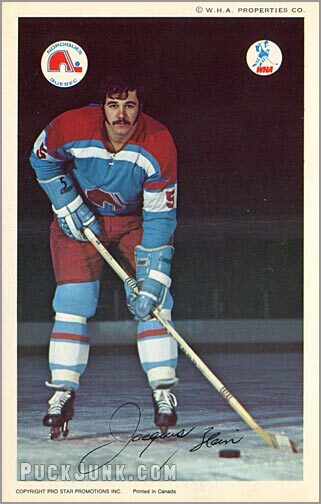 One founding member of the WHA was the Quebec Nordiques, giving the province of Quebec another team to call their own. 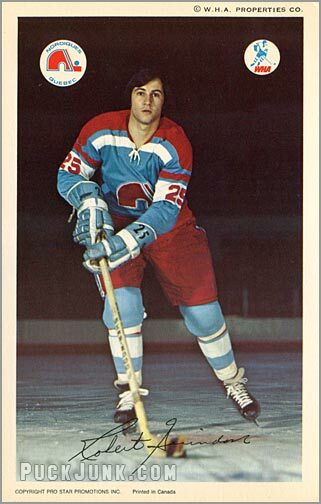 Longtime Montreal Canadiens’ defenseman J.C. Tremblay was the Nordiques’ first captain, while a 20-year old Richard Brodeur was breaking into pro hockey as the Nords’ backup. 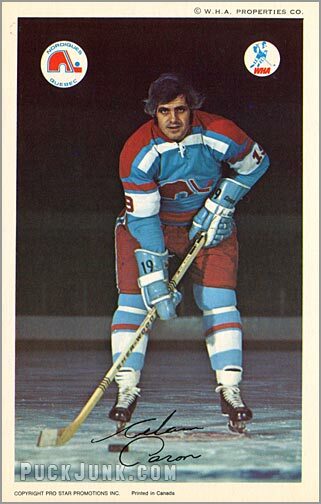 Released during the season was a postcard set featuring the Quebec’s inaugural roster. 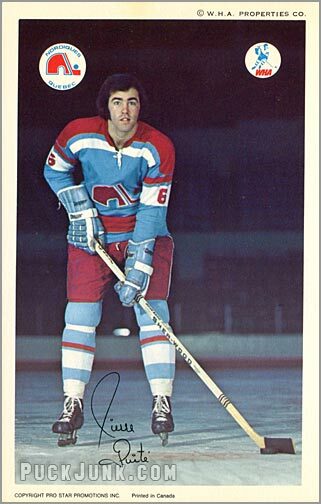 Most postcard sets of the era feature a lack of design – no name, logo or other elements to distract from the photo. 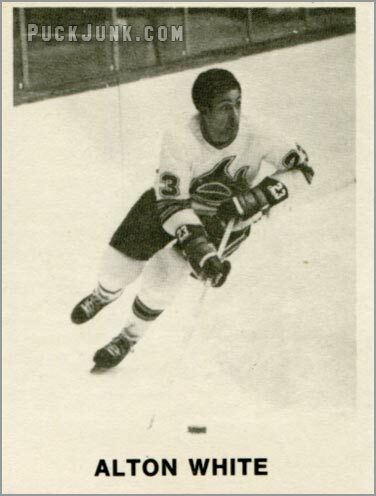 Also, many teams used black-and white pictures. 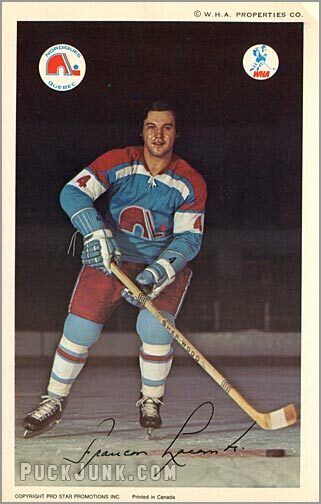 That makes this Nordiques set almost overdesigned by comparison. 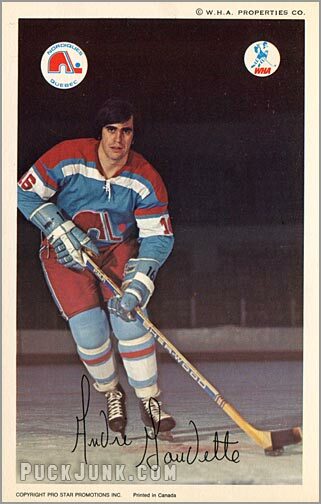 Both a Nordiques’ logo and the WHA log are present, adorning the upper left and upper right corners respectively. A white border frames a purposely dark, full-color photo. It is the photographs themselves that make this set truly unique. The darkened backgrounds, static poses and muted hues give these cards a somber, almost haunting feeling – as if the player were emerging from the shadows. Quite the opposite of the bright lights and fast action you expect in hockey. 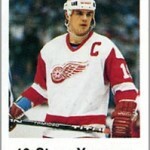 Also note the player’s signature at the bottom of each card. 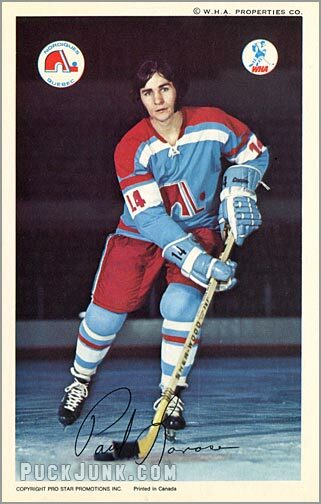 Although helpful for identifying the player, the signatures almost feel like an afterthought. 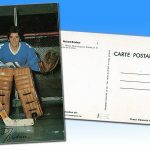 In fact, the facsimile autographs are hard to read on the cards of goaltenders Richard Brodeur and Serge Aubry. Like many other early team sets of the era, the back of each card is blank. 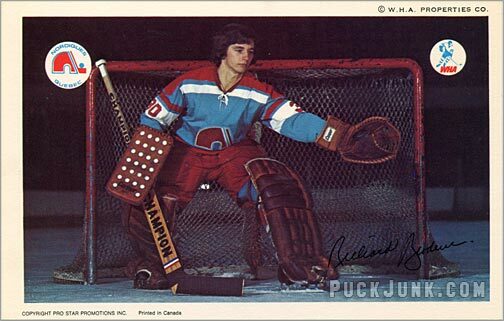 Beckett claims that a card of goaltender Jacques Lemelin was released as a part of this set. 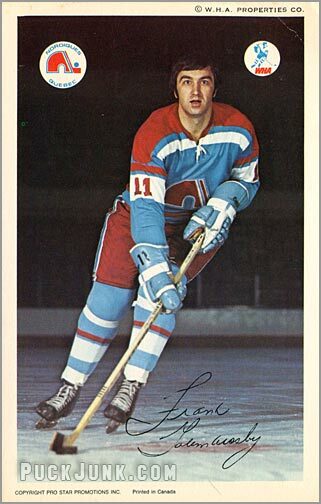 However, Lemelin only played 9 games for the Nords in ’72-73, so it is highly unlikely that a card of him was made. 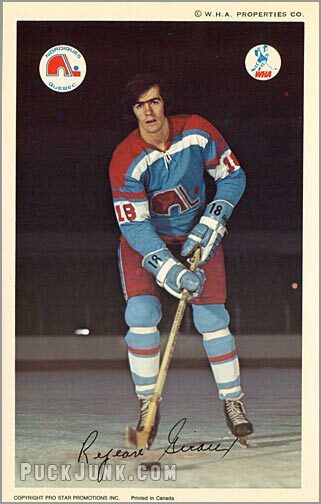 Secondly, Beckett mentions the inclusion of a header card – perhaps featuring the Nordiques logo. 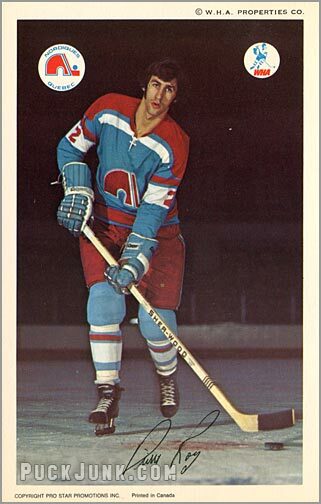 I’ve asked several collectors who specialize in vintage team issues, and none have ever seen a header card (or a Lemelin card, for that matter). 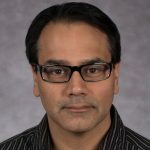 So I am going to say that a header card does not exist either. 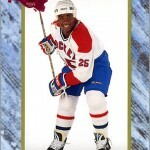 Finally, Beckett does not list goaltender Richard Brodeur as a part of the set. But as you can see by the picture above, a Brodeur card was indeed released. True, owning this set won’t make more people want to be your friend. 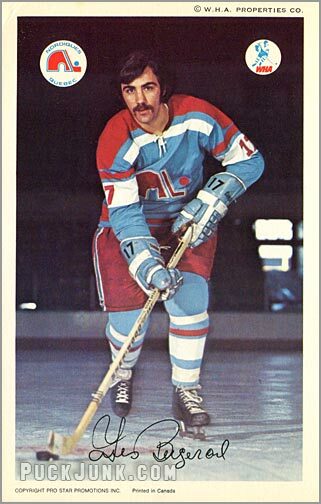 After all, the WHA was eschewed by many, and the Nordiques later became one of the worst teams when they joined the NHL. 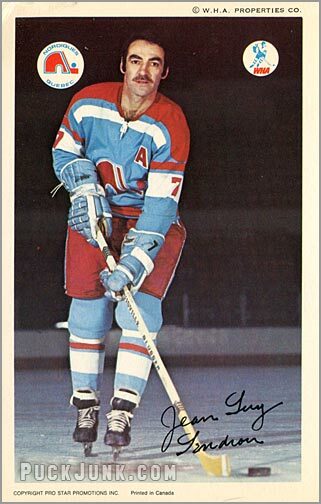 Still, this is an interesting set, harkening back to the era of no helmets, colorful uniforms and rival leagues. 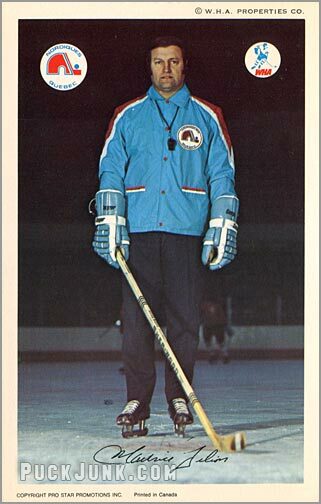 Plus, for a (nearly) 40-year old team-issued postcard set, it sure does look pretty cool. For your enjoyment, below are images of the entire set. Click on any one to start the slide show. Yes, this is a great set. It does remind you of the days of no helmets (although the Nords wore more helmets than most) and colourful uniforms. 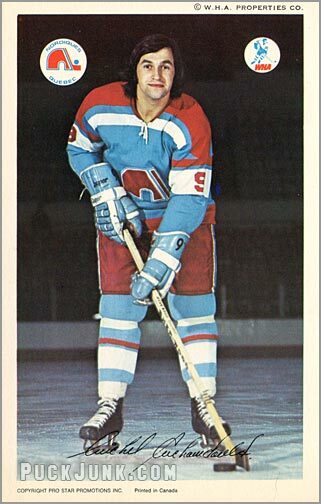 Remember when uniforms had colour? All these black & white uniforms make me wonder why I spent so much money on a colour TV that will break in 5 years when granny’s old B&W is in my attic and still works as good as new. Is it so that I can see the only things left with colour…the damn ads? But I have to set the record straight. 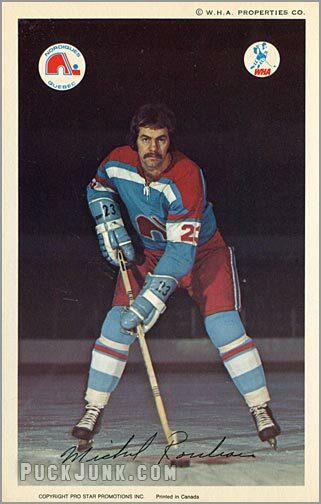 Les Nordiques were a great WHA team. 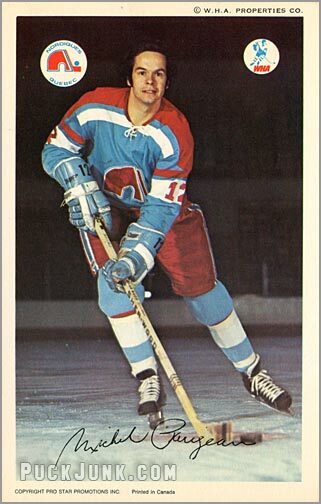 But, as with all the former WHA teams, the NHL’s terms of surrender were intentionally designed to crush them. But it didn’t take the Nords long to rise back up. 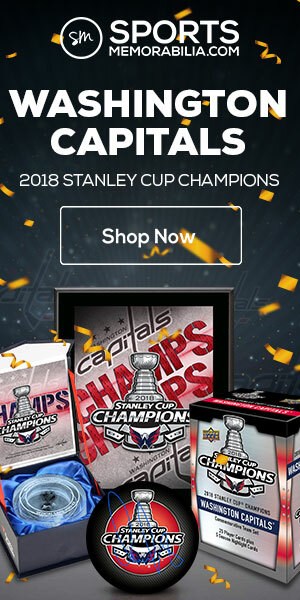 Unfortunately, they weren’t up there very long before they were dragged down by the nasty economics of the modern NHL…that were also designed to crush them and the other WHA/small market teams. 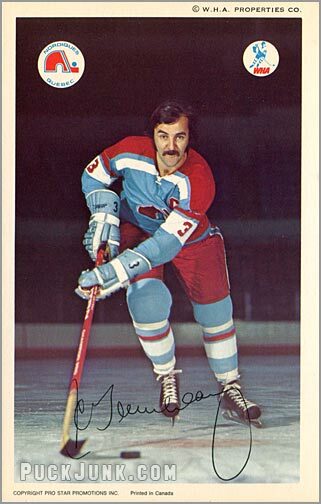 Only the once mighty Oilers live on, but only after a near-death experience. 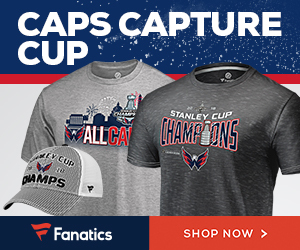 The NHL remains a bunch of greedy, vengeful, jerks. 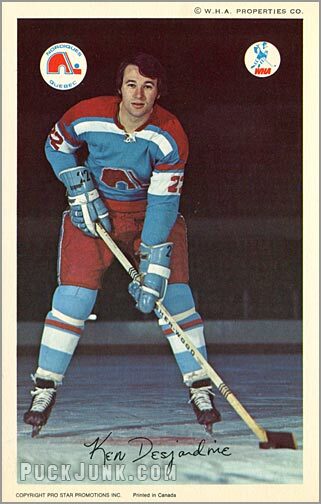 Anyway, the “worst” I can say about this set is that the team & WHA logo circles should have been a little darker/smaller or maybe just the logos themselves…and moved closer to the corners. 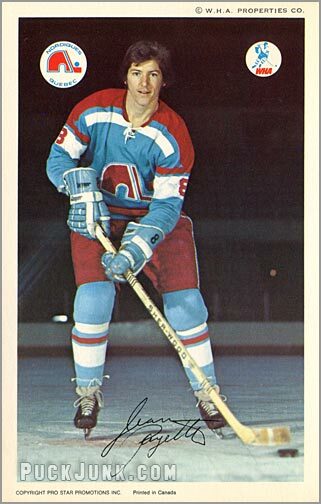 Putting them in the dark area rather than on the ice was a smart move because it allows you to see the magical effect of stick handling unmolested down the ice. 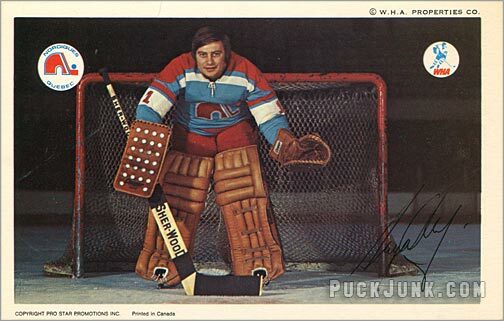 That’s half the beauty of the sport and these cards captured it well. Thanks for reading, and for sharing your opinion. Don’t encourage me. You’ll probably regret it.